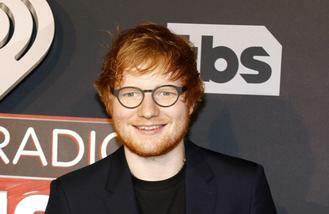 The 26-year-old singer-songwriter has adopted a more health-conscious lifestyle over the last 12 months, which has led to a dramatic weight loss - but Ed admitted he still felt uncomfortable appearing bare-chested in the video. He said: "My lifestyle changed. I realised I needed to start exercising, not necessarily to be slim but have a healthy heart. By exercising and not having such a wild lifestyle, you end up being a healthy human being. "Having my shirt off in the video wasn't my idea, though. It was the director's and it kind of happened very last minute. I wasn't really comfortable with it but he lit it in such a way that it ended up looking quite cool." Meanwhile, Ed also revealed how how his girlfriend Cherry Seaborn inspired his ballad 'Perfect', which appears on his new album '÷'. He told Us Weekly: "'Perfect' was the first song that I wrote for the album. It was inspired by Cherry. "The line that goes, 'Barefoot on the grass, listening to our favourite song' was about when we were in Ibiza listening to Future's 'March Madness' literally not wearing any shoes and going mental on the lawn, which was quite a nice time." And thankfully for Ed, Cherry - who he has known since his school days - was a fan of the track. He shared: "I didn't see her first reaction to the song because she lived in New York at the time. So I just emailed it to her but she did really like it."